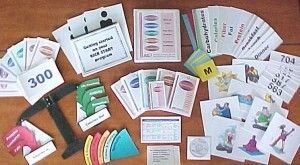 Add Printed Facilitator Guidebook & BOT Participant Set? *Add Visual Aids & Facilitator Case? Bariatric Patients who struggle with weight regain or extended plateaus need a structured program facilitated by skilled trainers. Our research shows that nearly 90% of struggling bariatric patients want a ‘bariatric specific’ program to help them deal with weight regain. 82% tell us that they would participate in such a program if their bariatric facility offered it. 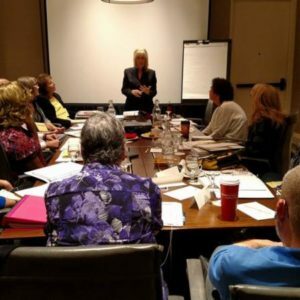 Take steps to implement a program by enrolling one or more of your bariatric team members in our Back on Track Facilitator Course. Now available as an elearning course, you may complete your certification online, at your convenience. You will have 90 days to complete the course. Facilitators receive Back on Track Program Set, Facilitator Guidebook and visual aids, games and handouts in digital format, or order the printed materials ready-made. 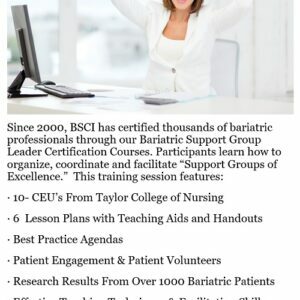 Course agenda includes research on bariatric weight regain, facilitator instruction, administrative and marketing ideas, coaching techniques and 10 CEU’s from Taylor College of Nursing. Certified Back on Track Facilitators may teach classes in one of three ways: 1. For a BSCI affiliated hospital, 2.As an instructor working with a BSCI Licensee, or 3. Independently, by applying for and obtaining BSCI’s Educational Program License. Excellent facilitator training session! Very organized and informative.